Here again H.G. Wells let us dwell in futuristic landscapes with our feet still in the present. It is amazing how this author manages to bring actual and current topics to fiction and future and mixes them to make you think about reality, it all with the perfect touch of entertainment, good narration, incredible stories and amazing characters you can relate to. I like the way he tells the story in this book, that first person telling us what he's seeing and how he deals with the situation he find himself into. 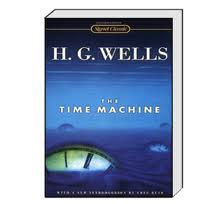 in my opinion a good piece of science fiction has foundations in reality and Wells is a master on that. I can't give a proper opinion on this book without giving spoilers, so I'll limit myself to say: this is one of the best books you could ever read if you're in love with fantasy, science and philosophical traits that leave a seed on your brain and generate incredible and new ideas on your possible future. He was a visionary. I loved it. I feel terrible but I have never read this book. Great review! You may be interested in reading The Lifeboat by Charlotte Rogan. The story follows a young woman as she attempts to survive after a shipwreck. It also details a murder trial and provides some interesting insights into the world during the early 20th century. I am currently hosting a giveaway of the novel, so follow the link below if you are interested. Thanks for your insightful reviews.